Today, let us examine this strange invention installed on water. It takes up a house-like shape and seems to have some sort of generator attached to it. Well…. Enough of the suspense! 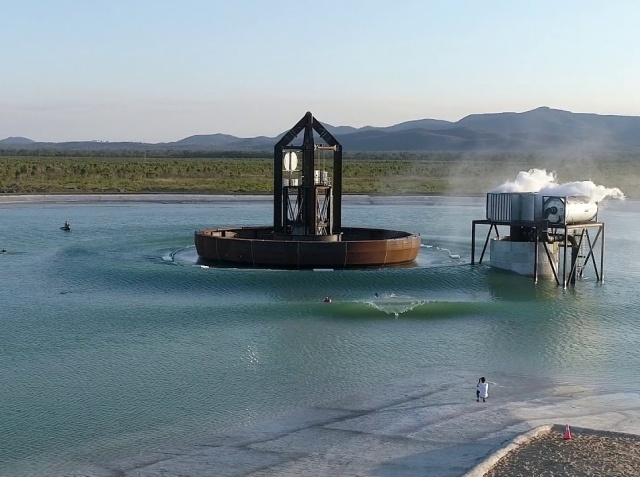 This device was invented in Australia, and based on its name; it functions as a generator which allows for the creation of artificial waves in a huge reservoir. According to its specifications, the wave generator will be able to create up to 2400 waves per hour! It was built to allow for varying degrees of wave intensity all based on the parameters that were set. This will allow surfers of all experience levels to participate in the wave fest and improve their skills. The pool where the generator is installed will be able to accommodate 240 surfers simultaneously. This will be the first time a device of this caliber will be created. Despite its other worldly look, many surfers are excited about the possibilities these types of wave creating devices could bring to the sea, and you should too!